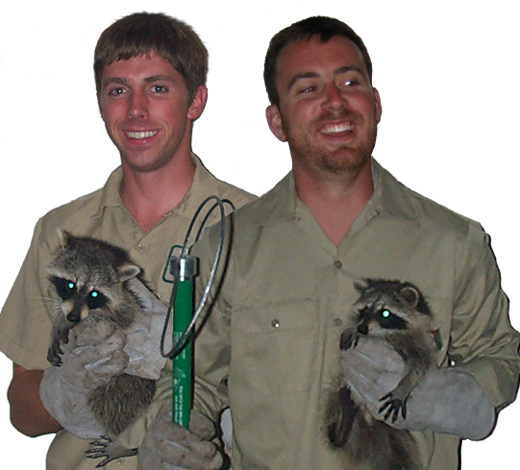 About Us - Information about Our Leon County Florida wildlife removal experts. Our company is dedicated to humane and chemical-free wildlife removal servicing Tallahassee and surrounding areas. Northern Florida is home to many nuisance wildlife species including several species of snake, some of them venomous. We also have digging critters like armadillos and moles. Raccoons and squirrels commonly enter attics in this region. Once we remove the infestation of wildlife from your house, the real important work is done - the repairs that permanently keep them out of your home. Our repairs come with a guarantee against any future wildlife invasions and are professional contractor grade and look great. We are licensed and insured and answer our phones 24/7. We service greater Tallahassee and surrounding communities such as: Black Creek, Baum, Bloxham, Bradfordville, Capitola, Centerville, Chaires, Chaires Crossroads, Gardner, Felkel, Fort Braden, Iamonia, Ivan, Lafayette, Lutterloh, Meridian, Miccosukee, Ochlockonee, Rose, Wadesboro, Monticello, Quincy, Woodville, and Thomasville GA. We also service the following counties: Grady County Georgia, Thomas County Georgia, Jefferson County Florida, Wakulla County Florida, Gadsden County Florida, and Liberty County Florida. We are ready to solve your Tallahassee wildlife removal issue! What will the county animal services do with a stray dog? When you call the local animal services to report a stray dog once you have found it, do you care what happens to it after that point? Do you know that it could be put down if it is not in the right state to be put up for adoption? If you want to find the answers to what really happens once you have reported that stray dog, you have come to the right place. Once you have done your duty to the local community and reported that stray pup, the animal control officer’s step up to the plate. They will track down the pup, as per your instructions and directions, pick it up and try to work out if it has a collar or not. If it does, their luck is in – a quick phone call to the number on the collar and they can either drop the dog off to its rightful owner, or arrange a suitable pick up point or time. If the dog doesn’t have a collar, their hard work really begins. They start by first taking the dog to the local animal services center where the dog will be look over and scanned for a micro-chip or a tattoo to hopefully give them some idea of who the dog belongs to. This is why you should always make sure that your dog has a form of identification, whether it is a collar or something more high tech, such as a tattoo or a micro-chip. If the dog has not form of ID at all, the hard work really begins. A vet will have a look at the dog to see if it is sick or needs treatment for diseases, fleas, ticks, etc. Treatment will be administered if necessary and the pet will also receive food, water and a nice warm place to lay their weary heads. Usually, the dog will be held at the center for a specific period of time. This will vary from state to state, dependant on local rules, but generally this will be around three to five days. You can give them a call or check out the website of your local animal services if you want to find out more information, such as this time period. It will be during this time that it will be decided whether or not the dog is suitable for adoption, and many factors will be taken into consideration. For example, the state of the dog’s health will be looked at, as well as its approximate age, and also the temperament that it is displaying. Obviously the fact that the dog will be under distress will be taken into account. Once all of these factors have been looked at, it will be determined – the dog will either be placed up for adoption to hopefully find new loving parents, or it can be put down if it’s health is deteriorating or if it unstable in temperament. There are ways that you can avoid the pup being put down if you cannot bear the thought of it. You can always adopt the pet as your own; once you have had it checked over by a vet and ensured that it has no owner. You can also take the poor pup to a no-kill shelter; details of which can be found on the internet. To learn more about our services, visit the Tallahassee wildlife removal home page.